Welcome to Shrewsbury Hose Company No. 1! We are a solely volunteer organization, who pride ourselves in serving our citizens with the best in fire protection and emergency services. Founded in 1908, we are still 100% volunteer, and ready at a moments notice. 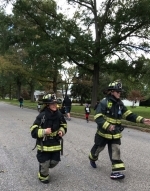 Firefighters Janna Meyers and Brent MacConnell represented the department Sunday in the Shrewsbury 5K, Great job to both. Thank you to all who supported our comedy night. A great time was had by all and funds were raised to support your local Fire Department. 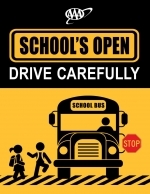 Please drive carefully at all times but take extra care now that school's are opening. Members of station 45-1 operated at a multi jusridictional natural gas drill. Numerous scenarios were conducted by the fire departments and EMS squads in attendance. 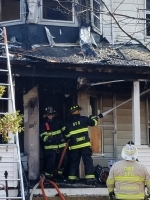 December 12th the members from station 45-1 responded into Red Bank for mutual aid at a structure fire on Rector place. Units responding included Tower 4590, Rescue 4585 and Chief 4568. Members responded to an MVA at Highway 35 and Sycamore Avenue, Engine 4576 and Rescue 4585 along with Chief 4568 responded. Members secured vehicles and assisted PD with traffic control. This site has been viewed 13,696 times.